Tagged under Bishoujo Senshi Sailor Moon, Twin Tails, Long Hair, Waifu, Bun Hairstyle, Children, Red Eyes, Pink Hair. Daughter of Neo-Queen Serenity and King Endymion. 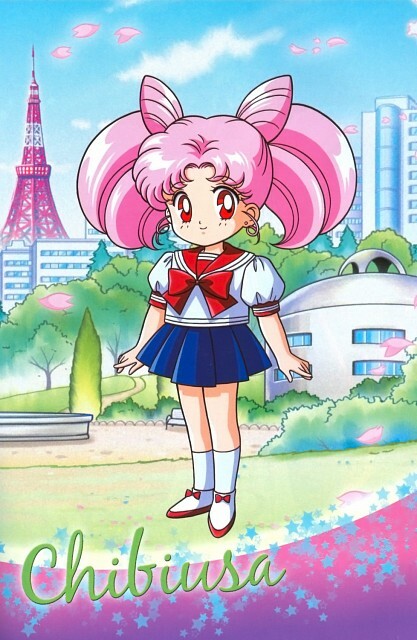 Her full birth name is "Usagi Small Lady Serenity", but she is referred to as "Chibi Usa" in the Japanese anime and as "Rini" in the American dub to differentiate between her and Usagi. Her name and rabbit ears-like hairstyle are an allusion to the story of the Rabbit in the Moon. Although her physical appearance is that of a child, Chibi Usa is actually over 900 years old. In the past, her best friend is Momoko Momohara. She is accompanied by Luna-P (a robot ball that can morph into anything Chibi Usa wants) and Diana. Later on, Chibi Usa is shown to form a deep attachment to Helios.